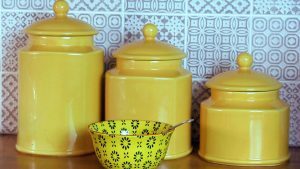 This is my post on how to create a yellow and grey kitchen. If you can’t view the video please click here. Trends come and go and I think it’s fair to say we are all loving the greys right now! Whatever shade you choose though, you can have too much of a good thing. This was the case with my kitchen so I wanted to do something about it. The room really needed cheering up so I decided to go for the colour yellow. I absolutely love the grey – yellow combo, and it’s definitely on trend so a win win situation. There’s always the risk that a fashionable colour scheme will tire quickly, but because I was only adding items to inject that colour into the room I felt quite confident. Importantly it wasn’t going to cost the earth! I started with the dresser as this was the ideal place to showcase my new colour. I basically shopped around to find anything I could that might help. 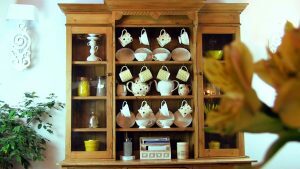 So I have yellow vases, I’ve lined the shelves with vibrant patterned serviettes and yes even a jar of feathers! It works..kind of! The yellow colander I will probably never use but think it’s quite funky. Even Dexter the cat has been given a yellow blanket to lie on as he loves to curl up on the bottom shelf! The funny thing about when you have your eye on a colour is that you start to see it everywhere. 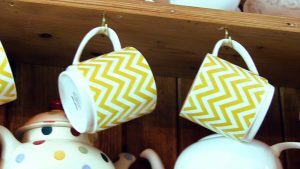 It was actually the day after I came to the decision to plump for yellow that I saw some canary tea and coffee caddies in a charity shop! I replaced my green water bottles, and a couple of large yellow place mats from Zara Home have introduced the scheme to the island. 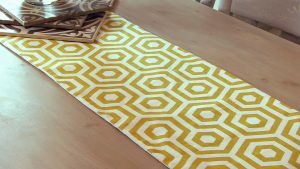 One of my favourite finds was a yellow geometric runner from Janelle Design which goes brilliantly with the grey table. I love having fresh flowers and must admit I try to get yellow ones when possible, but it’s worth thinking of how to use faux ones too. 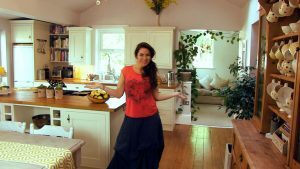 The spray shown in the video works brilliantly to fill the dull space above the cupboards and helps to get the colour up high. Of course because it’s not at eye view it looks real as well but is effort free. I toned it down with some dried eucalyptus. 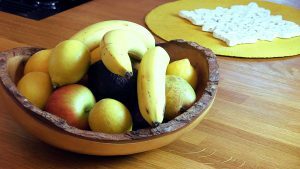 I will admit I don’t fill the fruit bowl with yellow items, but I did for this video!!! It’s quite nice in a kitchen to have little displays. 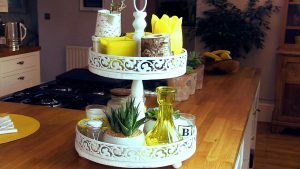 If you haven’t the room for a welsh dresser you could get a cake stand like mine. I’ve filled it with anything small I could get in yellow from Amazon and also some candles. I call it my carousel of colour! 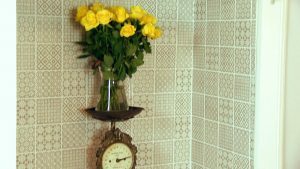 It’s really surprising how these small and inexpensive additions have really brightened up the room and give the sense of a grey and yellow scheme without it being too in your face. This is maybe something to consider if you want to revamp yours. If you want to add colour to your lounge, check out my post and video on how to make easy cushions which is a great way to add some colour to a room. It’s worth subscribing for free to make sure you never miss out on one of my videos. Please always feel free to ask questions and make comments – I welcome your feedback!